THIS ITEM IS NOT AVAILABLE AT PRESENT. WE WILL NOT BE GETTING ANYMORE Star Wars The Force Awakens Rey and Finn ArtFX+ Statue Set. From the Star Wars The Force Awakens collection by Kotobukiya. 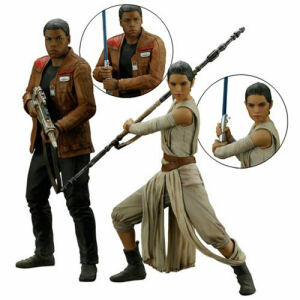 Star Wars The Force Awakens Rey and Finn ArtFX+ Statue Set. Highly detailed set of statues with extra weapons for dynamic poses. Sculpted in the 1/10th Scale.